Nope, not stopping yet. After this though things will get kinda back to normal. I saw the new Harry Potter movie last week. It was awsome, though still not as good as the book. They left out some of the really good funny parts that were in the story. Still, you can't really blame them when the book is three inches thick and they have to fit it all into a reasonable sitting time. The new movie is picking up where the last one left off. Voldemort is back and building up his army just like before. The whole wizarding world exept for a small band of wizards is bent on believeing that he's not back. The small band of wizards know better though and are attemting to building their own army to fight against he who must not be named. The wizards call themselves the Order of the Phoenix. Amoung them are firmilier faces such as Albouse Dumbldoor, the Weasly family, Mad Eye Moody, Remuse Lupin and others. Back at school, Harry and his friends struggle with homework, Draco Malfoy, and the new "High Inquiziter", Doloris Umbridge, a frusterating and hateful women sent from the Ministery for Magic to spy on Dumbledoor. It was a good movie with some funny stuff and some cool action. But like I said earlier, they left out lots of things. Alot of it dosen't make sence if you don't read the book first. Like one sene they're walking down an alley and the next second they're being attacked by monsters which they don't explain untill later. The monsters by the way are Dementors. Still, it was an over all good movie. From 1 to 10, I'd give it 9. 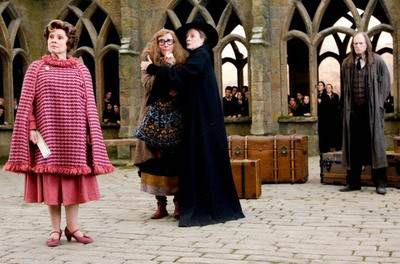 The picture above shows Umbridge fireing professor Trellany. I know, I KNOW, it hasn't been a week since Bridge to Terabithia but I'm trying to catch up with movies as well as artwork. Akeelah and the Bee is a generaly good movie about a girl that's good at spelling and a spelling bee, hence the name. But it isn't all that easy. Akeelah comes from a rather rough neibourhood. Between bullies at school and her mom giving her a rough time, it's hard for her to prepair. On a scale of one to ten, I'd probably give it an eight. It's a good movie to watch on a Sunday evening when your tired and want to do nothing but lie on the couch and watch T.V. The picture above shows Akeelah and her friend who's name escapes me at the moment sharring their vitory in one of the many bees. This movie was based on the awsome book Bridge to Terabithia about two kids who love to run. The kids decide to make up a magical world out of their imaginations. They call the world, that's right, Terabithia. While the kids struggle through school, they use their imaginations to turn their problems into adventures. The people that did this movie did a good job of it. You get attached to the characters and when I say this, I'm sure I'm speaking for alot of you, I cried at the end of the book and I cried at the end of the movie too. One more thing, don't let the trailers fool you with the cheesy computer affects. They're only in it for a tiny bit and the kids are only imagining them. The picture above shows the two kids racing eachother to Terabithia. Every weekend, I've decided to do a movie review on my blog. This friday I watched Superman Returns. I think the best part of it is Lex Luthor who is played by Kevin Spacey. As my evil stepmom always says, Spacey has a way of looking like he's 5 times smarter than everyone else in the room when he's acting. In the movie, Lex and a band of thugs attemt to grow a new contanent out of crystals and kryponite. Of course this looks like a job for Superman who has just returned from a 5 year journey in space. There are some fun scenes with some action but the overall story was ruined by some bad actors and acting. The guy who plays Superman for instence looks like a computer generated character from a video game. Another bad thing about it was that there was way too much moping and love scenes and alot of it was too dramatic. It's like; "come on! It's a guy with a red cape and blue tights! How sirius can you get?" Anyway, don't let me keep you from watching it. You might like it better than I do. 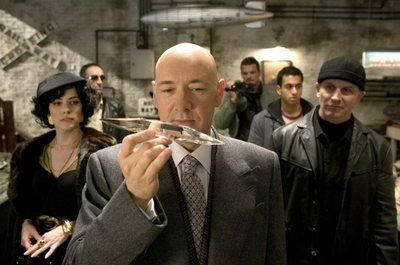 The picture above shows Lex holding a crystal from the Fortress of Solitude.